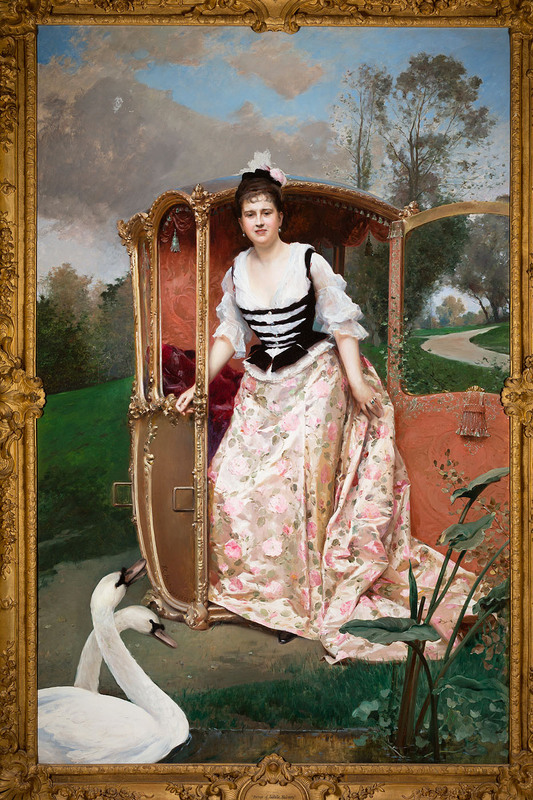 RAIMUNDO DE MADRAZO Y GARRETA (Spanish School, 1841-1920) An Exceptional and Palatial Oil on Canvas "Portrait of Isabelle McCreery” depicting an elegant woman gracefully exiting a litter (Sedan Chair), situated within a lovely fairytale setting of a fantastical vista dominated by verdant and blue-green hues, a pair of swans and a lily pad frame the scene in the foreground, within it's original impressive and ornate French 19th Century Rococo Style gildwood carved and gesso frame. Signed and dated ‘R. Madrazo, 1880' (lower left). 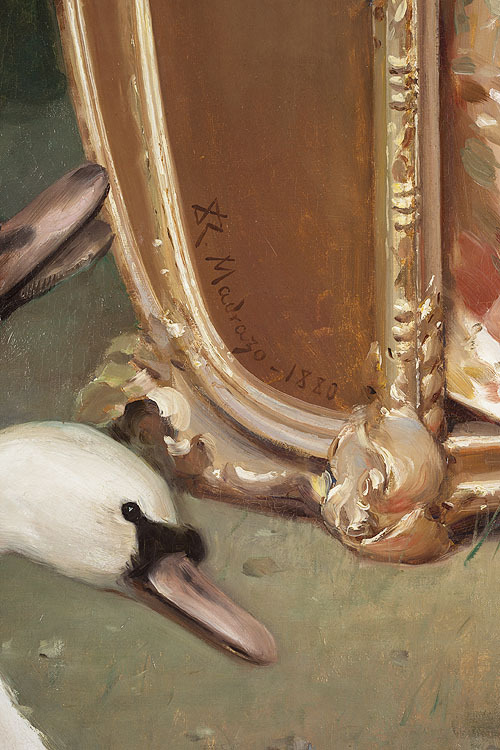 At the bottom center of the impressive frame there is a gilded, wooden cartouch bearing in italicized script “Portrait of Isabelle McCreery.” This is original to the frame. Sometime after the death of the artist, possibly at the time the painting was given to the Fine Arts Museums of San Francisco, the painter’s name was added in block letters. The work of Raimundo de Madrazo, an artist who lived in Paris the greater part of his life, is among the most representative and influential of the ‘school’ of Spanish painters resident in Paris during the nineteenth century.” (Carlos González and Montse Martí, Spanish Painters in Paris 1850-1900, London, 1989, p. 53). The wonderful imagination and artistic genius of Madrazo y Garreta established his fine reputation, and created an international demand for his exquisite portraiture. 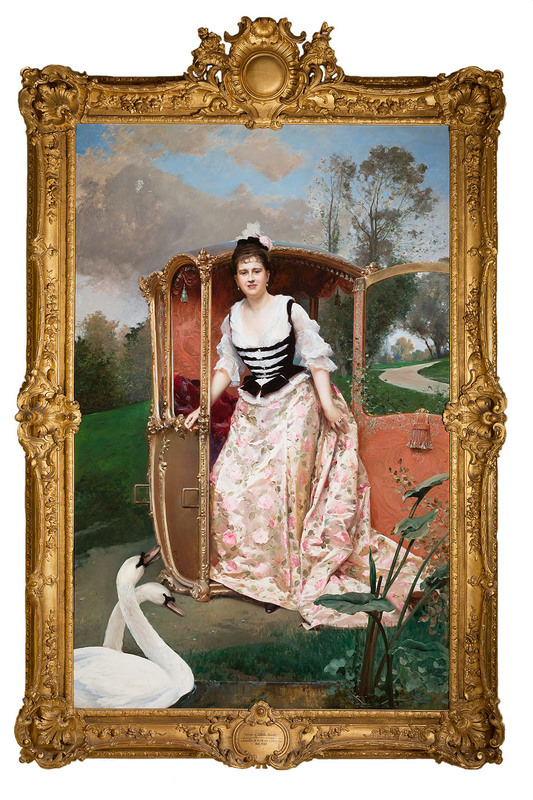 This particular work features an elegant woman who gracefully exits a litter, situated within a lovely fairytale setting of a fantastical vista dominated by verdant and blue-green hues. Isabelle McCreery was a member of the noted Gold Rush pioneer McCreery family of Irish background who settled in San Francisco in the mid nineteenth century. She later lived in Burlingame, an early San Francisco suburb south of the city, fronting on the bay. Burlingame was named after President Lincoln’s minister to China who loved the area, purchased land and built an estate. Miss McCreery lived in Burlingame, together with her brother Richard and his wife, for several decades. They are listed as living at Forest Hill, Burlingame, in the 1924 Burlingame Blue Book. Richard was a member of the nearby country club. Today there is a McCreery Drive in the area . Portraits present both the attitudes and lifestyles of the upper-class in any age. This especially is seen during the years following the Civil War and the era of the Belle Époque of the 1890s to World War I. The French and Spanish influence in portraiture reached as far as the United States and especially California. 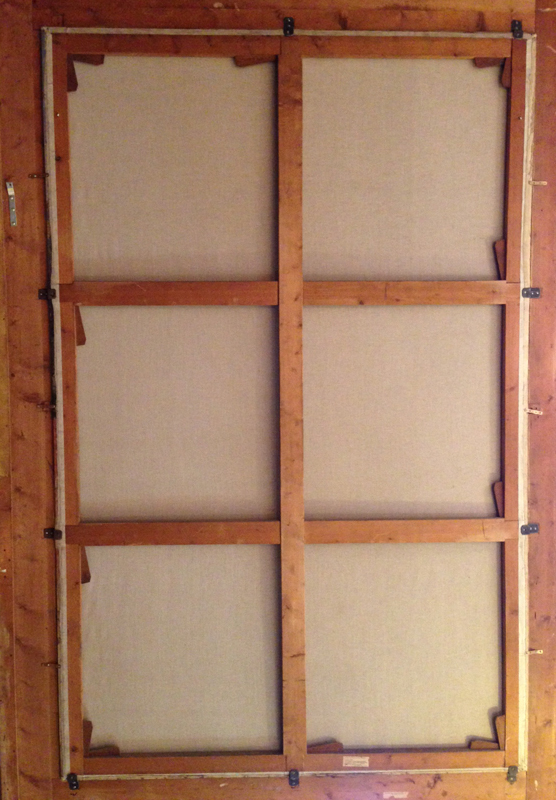 To judge by the lighting, it is safe to say that Isabelle McCreery posed for her painting, as the illumination is vertical and typical of a studio. Such commissions allowed the artist to fully showcase his exceptional talent and academic training, as every texture and colour is carefully treated to render an ethereal quality. The gentlewoman’s dress flows in a floral pattern that wonderfully compliments the curved forms and tones of the carriage from which she retires. High society of the Belle Époque regarded the woman as an ethereal creature, undaunted by the travail of everyday existence. 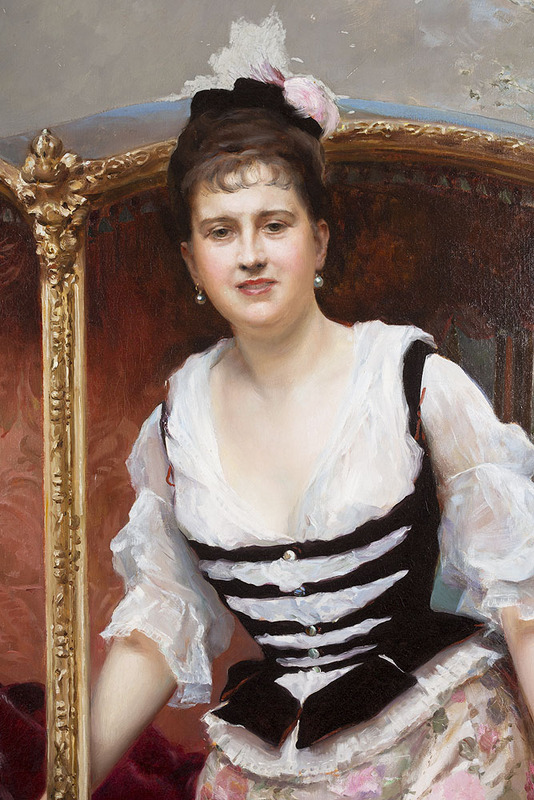 The refined brushwork and sublime setting render a regal quality to the portrait and indisputable grounds for the international esteem earned by the portraitist Raimundo de Madrazo y Garreta. 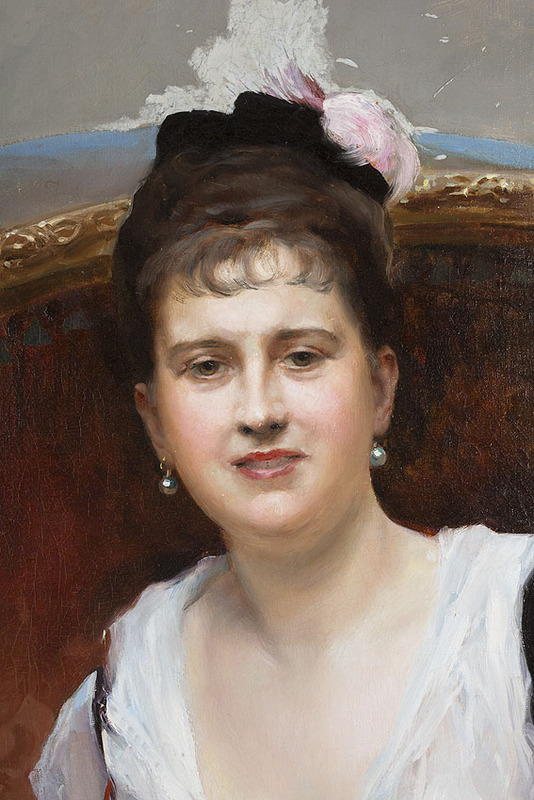 Raimundo de Madrazo y Garreta, the fashionable and extremely popular Spanish portraitist of the Belle Époque, was born in Rome on July 24, 1841 and died at his residence in Versailles on September 15, 1920. While he lived and worked in France for most of his life, he also spent time in the United States where he received numerous commissions to paint prominent Americans living on the east and west coasts as well as in the mid west. The artist was born of an aristocratic family of notable Spanish artists, and his childhood days were surrounded by wealth and the finer things in life. His father was the great history and portrait painter Federigo de Madrazo (1815-1894); his grandfather was José de Madrazo (1781-1859), the founder of the National School of Painting and Director of the Academy and Museum in Madrid. He also was the brother-in-law of the celebrated Mariano Fortuny y Carbó (1838-1874), noted as the greatest nineteenth century Spanish artist of the academic tradition. At the young age of fourteen Madrazo accompanied his father to the 1855 Exposition Universelle in Paris where he visited the studio of Leon Cogniet (1784-1880). He then attended school at la Escuela de San Fernando. He exhibited for the first time in Seville in 1858. In 1862, the young artist entered Cogniet’s studio for official instruction. He regularly visited the Louvre as well as the Luxemborg in order to practice copying the grand masters of the collections. Visits to the London museums led to his interest in the works of Sir Joshua Reynolds (1723-1792) and Thomas Gainsborough (1727-1788). During this period Madrazo made contact with Ernest Meissonier (1815-1891) who was a former student of Cogniet. In 1864 the artist temporarily resided in Madrid to study works at the Prado where he gained an admiration for the Spanish masters El Greco (1548-1625), Goya (1746-1828) and Velazquez (1599-1660). 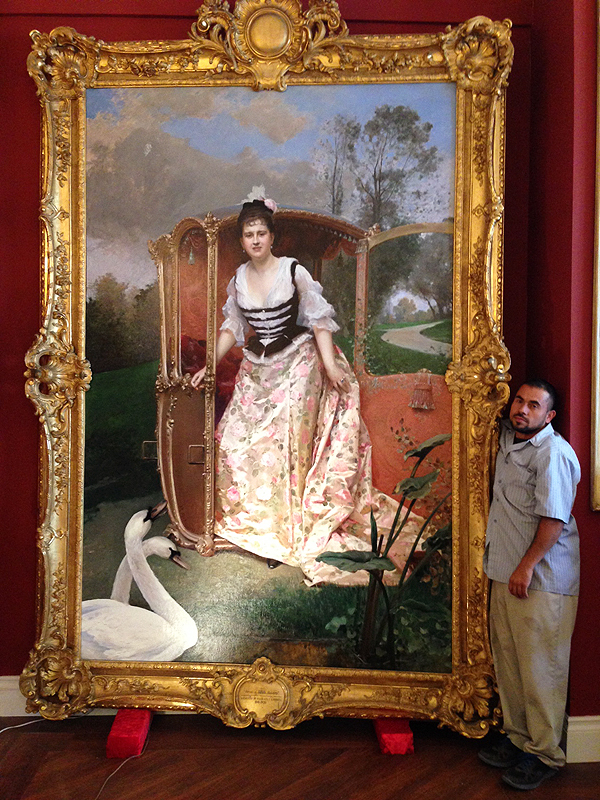 Madrazo exhibited in Paris where he received a First Class Medal at the Salon of 1878. Richard Muther recalls the Munich Exhibition of 1883: “Particularly memorable is the portrait of a graceful young girl in red . . . She is seated upon a sofa of crimson silk, and her feet rest upon a dark red carpet.” And he writes: “Equally memorable in the Paris Exposition Universelle in 1889,” when he won a Gold Medal, “was a pierrette, whose costume ran through the whole gamut from white to rose-colour.” He was named Chevalier in the Legion of Honor in 1878 and Officer in 1889. During this phase of his career he also would make sojourns to the cities of Chicago and Buenos Aires where he painted several commissions. Between the years of 1900 and 1905 he took residence in a New York studio and was named a member of the Hispanic Society in 1905. Museums:	Baltimore (Walters Art Gallery); Bayonne (Musée Bonnat); Cambridge (Harvard University Portrait Collection); Chicago (The Art Institute of Chicago); Cincinnati (Cincinnati Art Museum); Copenhagen (Ny Carlsberg Glyptotek); Glasgow (University of Glasgow Centre for Whistler Studies); Havana (The National Museum of Cuba); London (National Portrait Gallery); Madrid (Museo del Prado, Palais de Liria, Palais Montellano); Newport, Rhode Island (The Breakers); New York (Metropolitan Museum of Art, The Hispanic Society of America); Paris (Musée d’Orsay, Musée du Petit-Palais); Philadelphia (Philadelphia Museum of Art); Pontevedra, Spain (Museo de Arte); Washington DC, The Department of the Army Art Collection); Williamstown, Massachusetts (Clark Art Institute).